I am searching for a ways to preserve the banana, and most of the time they said that I need to wrap the stems in a plastic or scotch tape so the gas wont come, they said that this gas is the reason why banana ripens fast. I am thinking that maybe by separating each bananas then cutting the stem of each one of them instead of wrapping them will effectively preserve the bananas? It is very time consuming to wrap each one of the stem. From what I understand, ethylene gas is released at the stem. This causes fruit to ripen quicker. That's why you'd want to wrap the stem. If you separate them, you'd still need to wrap each one individually as gas is released there. There might be some additional benefit to separating it as, you can allow each banana to ripen at it's own rate. But if that's too time consuming, just wrap the whole bunch at once will offer some benefit. I can't imagine that taking more than a few seconds? Cutting the stems, I imagine would only serve to speed that process up. I eat a ton of bananas and was excited when I heard about this...but it’s a total lie. I did it for 2 weeks (2 bunches) and saw no difference. So, I did an experiment. I did 2 with and 2 without...then took a pic...then left them untouched on my counter for 4 days. Then took another pic. The ones wrapped looked EXACTLY the same as the ones with no wrap. Both equally spotted and soft. No preserving what so ever! I’m going back to using the “green bags”. They don’t work great but definitely better than doing the “plastic stem wrap”. I don’t see an option to attach the pics here but I’ll find another site that I can. It's very likely that any benefit gained by doing this will be completely destroyed by the act of cutting into the protective skin of the fruit. Once you do this, you're exposing the interior skin and the fruit itself to microbes in the air, which will be more than happy to colonize and eat away (i.e. rot) the banana you were trying to preserve. 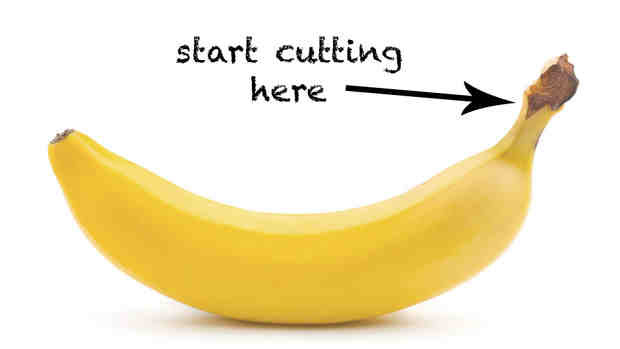 If you find it too time-consuming to wrap their stems to extend shelf life, you could seek out less ripe bananas so it takes longer for them to ripen, or buy smaller batches that you can eat in a shorter time so there's no need for preservation. Not the answer you're looking for? Browse other questions tagged storage-method food-preservation bananas or ask your own question. What's the trick to wrapping tightly in plastic wrap?